The Tibor de Nagy Gallery is currently presenting its fifth exhibition of works by Jess Collins, February 4 – March 19, 2016. 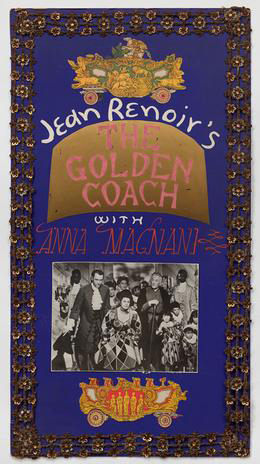 The exhibition includes collages, paintings, and a group of movie posters that Jess made for the New Yorker film critic Pauline Kael, who was his close friend. Many of these works are being exhibited for the first time. The exhibition presents a range of works from the 1950s to the 1990s, including major paintings (“Translations”), and collages (“Paste-ups”). In 1951 a two screen art house opened called “The Cinema Guild and Studio” on Telegraph Avenue in Berkeley, just south of the university campus. Kael’s imaginative, unexpected pairing of films, along with her booking of many unfamiliar European titles, soon attracted devoted and enthusiastic audiences.